A luxury keepsake box with a magnetic fold down lid. 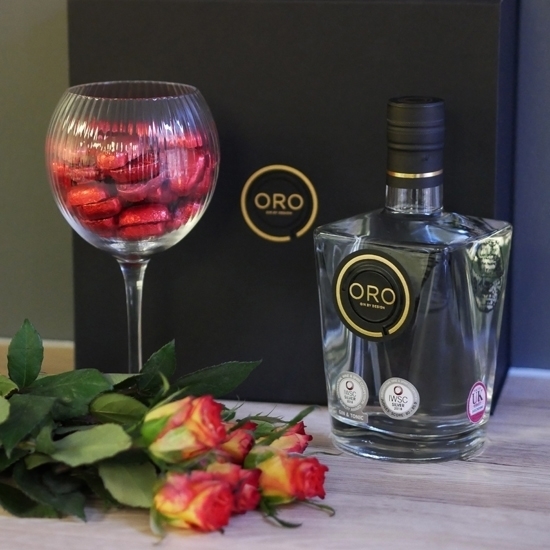 Which contains a bottle of award winning Oro and a beautiful art deco styled Oro glass, discretely etched with the Oro logo. The glass containing delicious caramel filled milk chocolate hearts. The perfect gift for gin and choclate lovers alike. Please note: Due to the fragility of the glass we send the gift boxes by courier, therefore select standard shipping only, as this will be next day delivery.